Previously on Star Trek Discovery: A RoboSquid from the future attacked one of Disco’s shuttles and accessed the ship’s data core. The crew on the shuttle beamed out right before it blew up, but not before something infected Airiam (Hannah Cheesman). Saru (Doug Jones) got a pretty good look at the Red Angel, and Pike (Anson Mount) and Tyler (Shazad Latif) have been battling it out over whether its intentions are benevolent or not. 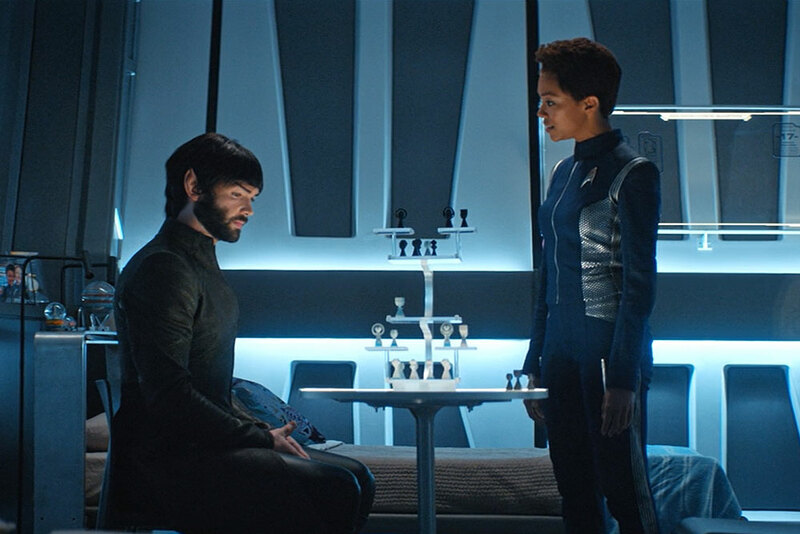 Admiral Patar (Tara Nicodemo) insists that Spock (Ethan Peck) is guilty of murder, and that Burnham (Sonequa Martin-Green) has committed another act of mutiny by helping her brother. But Burnham has seen Spock’s memories, and there were no murders. In fact, the Red Angel showed Spock the future of their current timeline – the end of all sentient life in the galaxy. With Spock on board Discovery, everyone is a fugitive. So it’s time to run. Admiral Cornwell (Jayne Brook) arrives on Discovery via shuttle, supposedly without being tracked. Pike wastes no time in complaining about Section 31, but Cornwell doesn’t have time for this – she wants to speak to Spock immediately. In an exam room, Cornwell maps Spock’s brain, comparing it to his medical records, before she begins questioning. Spock asserts that he didn’t leave the medical facility without permission because, sine he admitted himself, he did not need permission. Cornwell then presses on why he murdered three people. He didn’t. Okay, then did he kill them in self-defense? No. Then why did he kill them? He didn’t. You’d think she’d catch on faster. And the computer confirms that Spock is not lying. Also innocent, according to Burnham, is Tyler. She tells Pike that she knows Tyler and he wouldn’t sabotage their ship. She wants to talk to him, but Pike refuses. The mission is priority, and he needs her to work on the Red Angel problem. But she’s also determined to prove Tyler’s innocence. Spock recounts his escape, and explains the Vulcan Nerve Pinch that allowed him to do so without causing lasting harm. But why escape at all? At first, Spock thought his visions weren’t real, but once realizing they were, he needed to take action. Any idea why the Red Angel choose him? Nope. Not a one. What to the visions mean? The end of all sentient life in the galaxy: “No humans. No Vulcans. No Federation. No conscious life of any kind.” As the computer again confirms that Spock is being truthful, Burnham just walks in the open door (what?) and agrees with the computer. 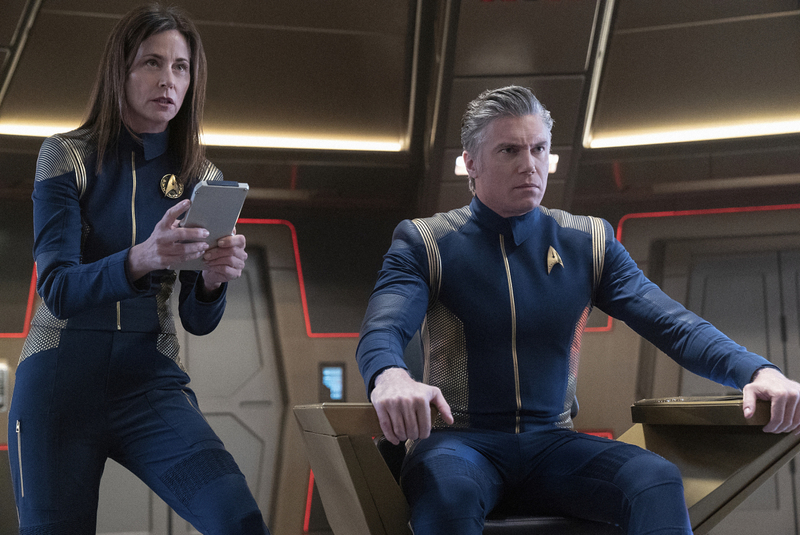 Cornwell goes over the results of her interrogation with Pike and Saru, and admits that Spock is telling the truth, or at least believes that he is. But then she shows them the recording of Spock’s escape, in which he attacks and then phasers two security guards and a doctor. And that footage comes directly from Psych – she checked. But, Cornwell’s been trying to reach the Section 31 admirals for weeks with no response, and her passwords for Control, the Section 31 threat assessment system, have stopped working. She suspects Admiral Patar, a Logic Extremist, locked her out. When the red signals appeared, Patar starting lobbying the Federation to turn all of its decision-making over to Control, with no human element whatsoever. Cornwell wants to go to Section 31 HQ, where Control is housed, arrest Patar, and reset the system. Pike is on board. Tilly (Mary Wiseman) has been able to track where Tyler sent those unauthorized messages – an abandoned penal colony. Except it’s neither of those things. Those coordinates are for Section 31 Headquarters. Detmer (Emily Coutts) sets a course, and Tilly sets to work on decrypting those messages to find out what exactly was sent. In her quarters, Airiam is sorting through her memories, in what is apparently a normal weekly process. She watches two people on a beach, recording a message home, about how they’d just eloped – and saves it. She deletes memories of mundane tasks, walking about the ship, etc; but saves those of interactions with her friends. Tilly arrives and jokes with Airiam, then notices a photo and a small jar of sand on a table that wasn’t there before. The photo is of the two people in that first memory, and Tilly asks if the sand is from the beach in the photo. And that’s when we learn that the woman in the photo is Airiam. That image was taken on their last day together, shortly after they eloped – their shuttle home “went down” and her brand new husband was killed. (Is this possibly why Airiam was cybernetically augmented? Perhaps it was not a choice?) Airiam shakes off the emotions and asks Tilly why she stopped by – decryption help. And they head off to the bridge. Stamets (Anthony Rapp) is in Engineering, trying to figure out what is missing from the Spore Drive and talking to himself. He urges Spock and Burnham to talk as well, because he doesn’t want to listen to himself. Burnham is looking for a pattern, but not having much luck – the signals have appeared without the Angel, the Angel without the signals, and they have appeared together. Who is in control? Spock believes that the Red Angel’s intent it simply to warn them. And he’s more concerned with why it chose him and he can’t logically determine how he’s supposed to prevent these events. Stamets regrets his earlier urging and asks the siblings to go find their logical inspiration elsewhere and gets back to work. On the bridge, Airiam sees why Tilly’s having a problem and is able to implement a fix almost immediately. As soon as Tilly turns her back, however, the three red dots in Airiam’s eyes activate. Airiam suggests that Tilly returns to her station while she continues to work. As Disco gets closer to its destination, Cornwell briefs the bridge crew on S31HQ’s defenses and… mines. Illegal mines. And Pike is again annoyed and frustrated by how far the Federation slipped during the Klingon War, and if he’s been around, he wouldn’t have let this happen. On the contrary, Enterprise sat out the war because, had the Federation lost, they wanted to best of Starfleet to survive. So just ignore the use of mines, okay? Arriving in Burnham’s quarters, Spock take the opportunity to insult her lack of personal effects… but she doesn’t have a 3D chess set. Spock’s trying to figure out how to save the galaxy and she wants to play a game? Well, yes, but Burnham thinks that a game of chess might jumpstart Spock’s logical thinking once again. Airiam is in the science lab, and begins downloading something, likely Sphere-related, since that’s what’s up on her screen. Nhan (Rachael Ancheril) stops by to let her know that Tilly is looking for her help again. Airiam asks about Nhan’s augmentation, confirming that it allows her to breathe the atmosphere on board (and presumably on M-Class planets) – just out of “curiosity.” She turns away as her eye dots activate again, and turns back around to leave for the bridge. Nhan is definitely suspicious of whatever that was, and follows. Whatever Airiam did before is no longer working – as if the system changed its tactics in response to their actions. And Airiam starts to get suspicious of herself, asking Tilly to stay by her side, no matter what, while she works on this problem. Tilly’s confused, but agrees, and Nhan will be keeping a close eye on them. The ship drops out of warp in front of S31HQ, with mines armed, and no one responding to hails. Cornwell provides Detmer with a map through the minefield, and and btw, the shields will have to stay down because the mines are attracted to them. Spock is intentionally playing chess illogically, and it’s frustrating Burnham – she thinks he’s just not trying. Instead, he’s disrupting expectations. He resents her help, and her judgement, and the way she tried to assume control of every situation. She could not have stopped her parents deaths, or prevented the Logic Extremists from targeting Sarek’s family, and of course the entire Klingon War was entirely her fault. “You avoid reality because it is easier for you to shoulder burden then to face unimaginable grief.” So clearly these two has not patched things up. But Burnham believes that Spock needs to take a step back and figure out why he’s so angry – because he failed as a Human or as a Vulcan? No, he’s just angry, and he’s enjoying expressing that emotion. And knocking over chess sets. Spock storms out, and Burnham is called to the bridge. Detmer flies Disco into the minefield, following Cornwell’s course. Burnham arrives and learns about S31’s defenses for the first time. Now it’s up to her to find a way to scan the facility while Tilly and Airiam continue to work on decryption. And here comes the first complication – some of those mines are “blade mines” which will just slice up the hull. And they’re headed for Disco as if someone is directing them (wink, wink). One of them hits the hull and starts slicing. Pike orders shields up, which will attract all of the other mines, too, so Detmer begins evasive maneuvers. Airiam’s eye dots blink, and she sends Tilly away with little resistance, and resumes her download. No matter the evasive pattern they fly, the blade mines seem to be anticipating the ship’s movements. And that’s when they reach the “blackout mines” which mess with sensor readings, so it’s up to Detmer to fly blind. And Starfleet Command is not responding to hails. Burnham posits that the mines are programmed like a computer game, which can anticipate actions after just a few moves. They need to disrupt expectations, just like her brother playing chess earlier – at least that game helped her if it didn’t help him. Pike orders evasive patterns in a call and response format, from stations on the bridge. As Disco approaches S31HQ, Airiam finishes downloading and sends a message, and the mines stop pursuit and begin to move away. A hail comes in from Admiral Patar, who informs Pike that her order to attack Discovery was issued by Starfleet Command. A Section 31 ship is en route, and Discovery will be boarded and the crew arrested. Byeee. Cornwell is not ready to give up. They need to get over to that station and reset Control, and Pike agrees, ordering Saru to put together an away team. Except that Saru wants to check something out on the bridge. No questions asked, away team duties fall to Burnham. Burnham was able to run some scans and learned that life support and power on the station have been disabled, except for in the Data Center, where Control is located. The away team will have to beam over in EV suits. And they don’t know if there will be any kind of guards. One the team gains access to the Data Center, the plan is for Airiam to beam over and start the reset. But she wants to go with them from the start. You know, in case there are any backup systems or whatever to circumvent. Sure. The station is abandoned, and the away team encounters floating balls of frozen blood as they move about the hallways, mag-boots engaged. Nhan goes off to reactivate life support, Burnham comes across evidence that someone was trying to pry open some doors, and Airiam’s eye dots blink. As Burnham turns the corner, she comes face to face with a floating, frozen Tellarite corpse. She looks up to see three more bodies, at least one of which is Andorian. Nhan restores life support and gravity systems, and the bodies thud to the ground. Burnham and Airiam stow their helmets and examine the bodies – they’re frozen solid and have been dead for at least 2 weeks. And then Burnham turns over… Admiral Patar! These are the same 4 admirals that were speaking with Leland at the beginning of last week’s episode. What the what is happening? 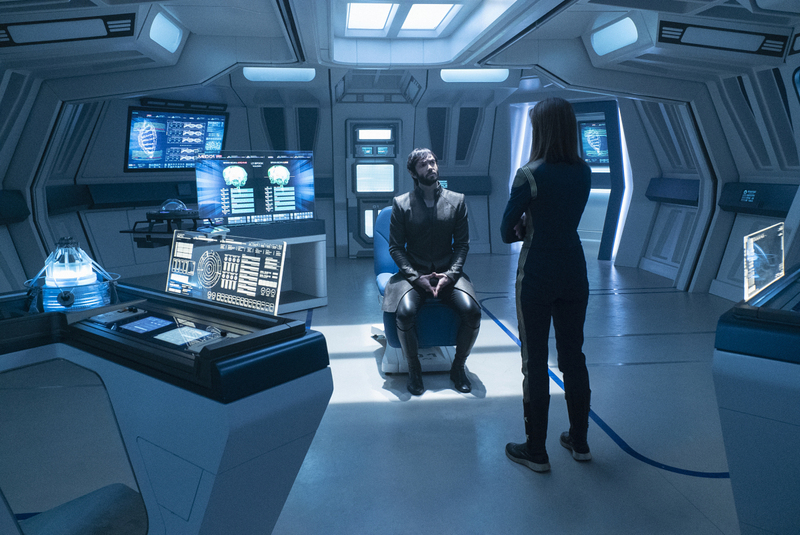 Saru thinks he knows – He noticed that Admiral Patar’s heat signature did not change when Cornwell and Pike challenged her authority. Normally, a stressful or emotional situation would result in a change of heat signature – even for a Vulcan. But the lack of changes means the Patar who hailed them was a hologram created by Control. Saru also analyzed the heat signatures in the recording of Spock’s escape from the medical facility. More holograms. Section 31 framed Spock. And Control created this evidence, then created the hologram of the admiral. If Control allowed a team to board the station, it must want something from them. Or from Airiam. 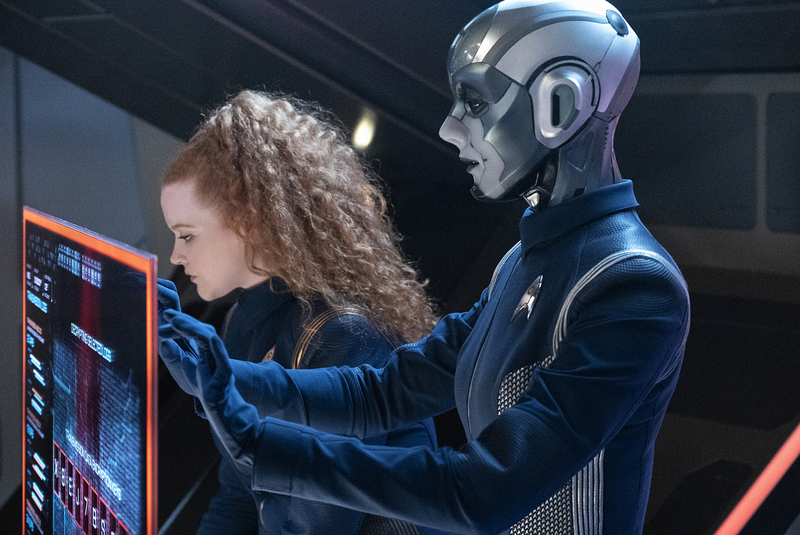 Tilly checks the computer core usage for the crew – Airiam has downloaded her entire memory bank to Discovery before beaming over. On the station, Nhan rejoins Burnham. 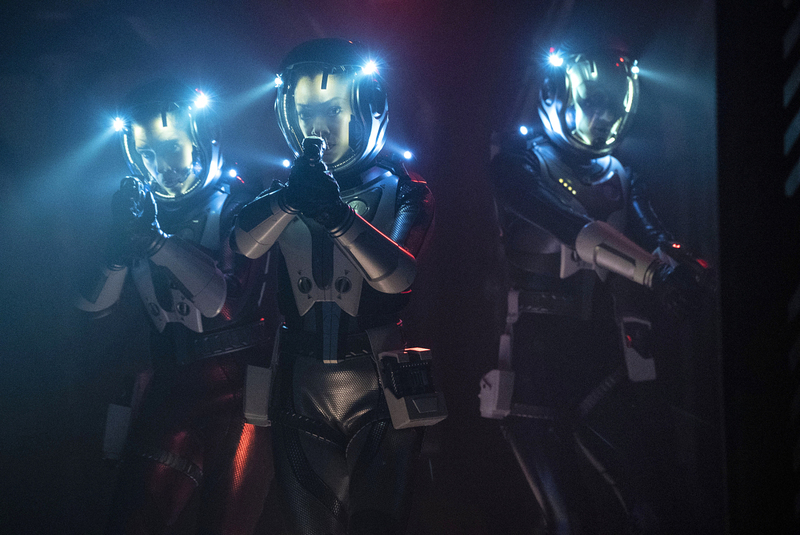 As they try to figure out what would cause the entire station to malfunction, Pike calls over on a secure channel to Nhan and Burnham and tells them to stop Airiam. Dude, she’s still in the room – she can hear you. And she goes full Terminator. She grabs Nhan and rips one of her breathing implants off of her face before throwing her across the room, where she appears to pass out reaching for her implant. (Couldn’t she reactivate her helmet and adjust the settings to create a breathable atmosphere for her?) 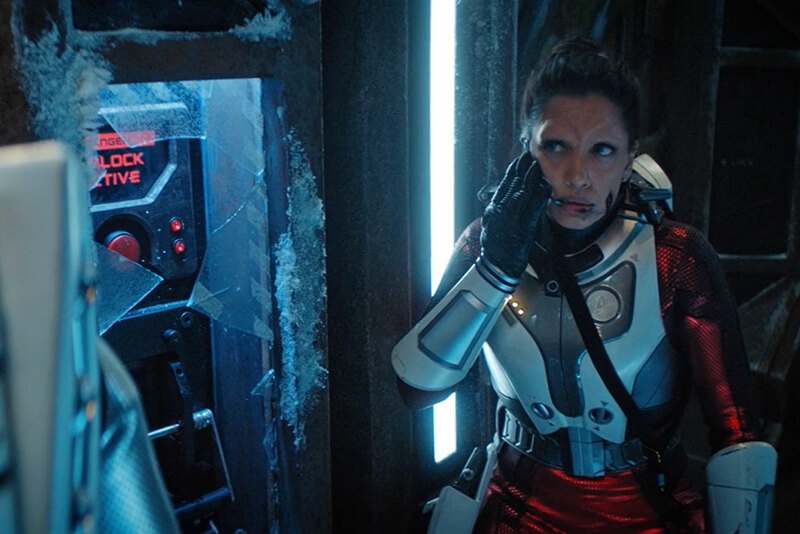 Airiam and Burnham continue to fight, and Burnham is able to back her up into an airlock and shut the door. Tilly’s figured out that the messages sent to Section 31 contained information from the dying sphere, and that’s the same data that Airiam downloaded – all the information it ever collected on artificial intelligence. Enough knowledge for Control to evolve and become fully conscious. Once it did, it could destroy all other sentient life in the galaxy – just as Spock’s vision foretold. Burnham attempts to delete whatever Airiam uploaded, but Control shuts the door to the access panel before she can reach it. Tilly can’t access the system from Discovery, and definitely can’t hack Airiam. Airiam, meanwhile, has taken an access panel off the wall in the airlock and is attempting to manually override the door. Tilly sends Airiam her “favorite memory” – whether it’s an attempt to help her regain control or just to comfort her, we don’t know. Michael returns to the airlock door, as Pike finally orders her to open the airlock. Airiam, apologetically, tells Burnham, “Everything is because of you.” Then asks her to tell everyone she loves them, and to find “Project Daedalus.” (Mythology note: Daedalus is the father of Icarus [famous for fyling too close to the sun on wax wings] and is the creator of the labyrinth, which housed a minotaur.) Burnham wants to ask more questions, but the airlock opens and Airiam is blown out into the space. Nhan, holding her remaining breathing implant to her face, was able to reach the controls and open the airlock. As Airiam floats in space, she replays the memory of her last day with her husband, telling her friends and family that they’re coming home. Next week… I’m not really sure. It looks like Tyler and Burnham hook up while the crew builds Spock a chair reminiscent of Barclay’s in “The Nth Degree.” But episode 10 is titled “The Red Angel” so maybe it’s time for some answers. As this episode was playing out, I was getting angry at the likelihood that Nhan was going to be killed. Then I got REALLY angry that they killed Airiam just as we were starting to learn about her. Together with Season 1’s offing of Landry (twice! ), Georgiou, and Culber, I’m annoyed at their killing main characters, particularly women. Yes, they brought Culber back (but not whole) and Georgiou back (but as a conniving opposite to what her character originally was), but it’s just not the same. For the second season in a row, I have to stop getting emotionally involved in this show. I can watch it, but I can’t allow it to get to me like Star Trek usually does (and should).